The Benz Pipe Burst Tester (PT2100) tests pipe, tube and hose from 1/8" to 12.0", measuring burst pressure up to 3000 psi. Custom burst pipe testers can measure higher pressures and larger diameter samples. 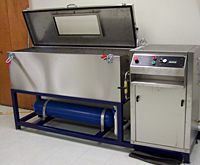 The Benz Pipe Burst Tester is unique, with a push-button, dial-in control panel and a dedicated microprocessor controller designed specifically for testing pipe, tube and hose.